My brother in law came to visit us this weekend, and I wanted to make a special breakfast for him before he left. 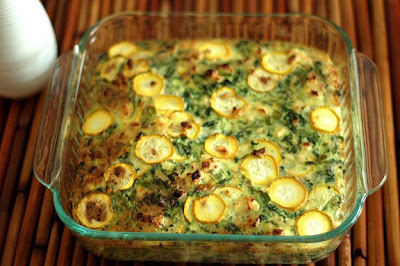 I had been craving some quiche (which is strange because usually I'm not an egg fan) and when I was at the grocery store yesterday I spotted beautiful yellow squash and the rest I just improvised. 1. Preheat oven to 350 degrees - coat a 9 inch x 9 inch glass dish with crisco. 2. In a bowl, mix sour cream, eggs, milk, a pinch of salt, a pinch of pepper, and a dash of garlic powder. Mix until fairly smooth. 3. Add most of the feta (saving some for the top) and the shredded cheddar to the egg mixture. 4. Slice the yellow squash into thin medallions, reserve some for the top, and add the rest to the egg mixture. 5. Chop the green onions and drain the spinach, add these to the mixture as well. Make sure the spinach is thoroughly drained. You can do this by simply squeezing portions of it in your hand as hard as you can. Mix everything together well. 6. For optional 'crust' just sprinkle about 1/2 cup of the bread crumbs across the bottom of your dish. 7. Pour egg mixture into the dish. 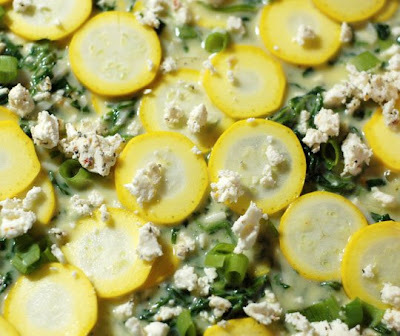 Take the reserved feta cheese and yellow squash medallions and top the quiche with them. 8. 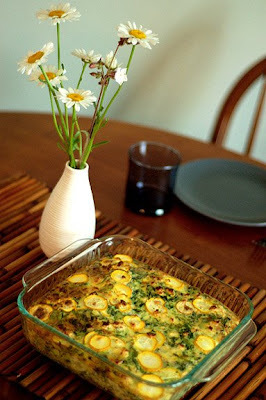 Put it in the oven for anywhere from 45 minutes to an hour depending on your oven. It is done when it is mildly golden on the top. To make extra sure, you can insert a toothpick into the center, and if it comes out without any egg mixture, it is done! Happy Eating!! I totally need to make this --it looks scrumptious! We had leftovers the next two mornings.